There are 4 items in this category priced between £2.07 and £8.33. When it comes to efficient and economic indoor lighting sources, the 12V MR16 LED bulbs are the right solution. They can have multiple uses in both residential and commercial settings such as meeting and conferences rooms. Products of this kind belonging to the LED spotlights category are manufactured by Mirrorstone Lighting in accordance with all the EU regulations in force, while using the latest MR16 LED technologies. For instance, in all types of MR16 LED bulbs of 5, 6, 6.5, and 7W powers are used the best SMD LED chips with a lifetime of around 50,000 hours. Usually the MR16 LED bulbs come installed in MR16 spotlight cases. There are two types of bases used for the purpose: one is the MR16 GU10 base and the other one is the MR16 GUS.3 base. Our MR16 LED bulbs and lamps are available in divergent colours such as sun white, warm white, and pure white. Another characteristic of the Mirrorstone 12V MR16 LED products is that they generate a significantly lower temperature in comparison to the traditional halogen spotlights. More specifically, halogen solutions generate temperatures of 130 degrees C while these Mirrorstone LEDs generate temperatures of 80-90 degrees C.
Last but not least, the MR16 LED bulbs that we provide are available in different angles of 45, 70 and 120 degrees. 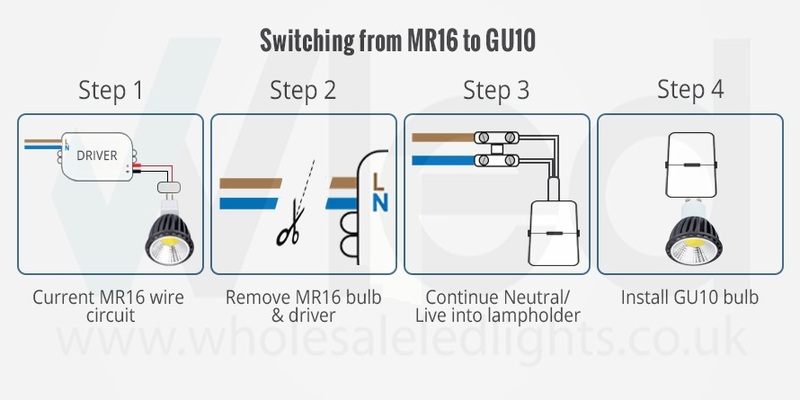 One of the major benefits of using the MR16 LED lamps is that they can save energy to the extent of 85% without dimmers. They can also generate brightness of 700 lumens and 5,000 Kelvin when used as lamps. We offer our clients a 28 days returns policy, while we also try as much as possible to dispatch within 24h from ordering date. A customer oriented warranty policy, regular volume discounts and frequent promotional code offers are some of the main benefits you get when buying from Wholesale LED Lights. Also, we come up with the “earn points on every purchase program” that allows our clients to earn points that can be used later to reduce the price you pay for products available in the store. Within this range, examples of two best sellers are the MR16 LED 27 SMD, 450 LUMENS and the MR16 LED 4W, 300 Lumens. Not sure about all these technical specifications or where to start from? Give us a call or check this how to buy LED guide we’ve prepared for you.